A teenage girl, brutally murdered and left in a trash dumpster; a young man, killed in a firebombing attack; a soccer mom, shot in the living room of her home; vicious thugs whose job is to protect a suspected criminal. Just another week on rotation for LAPD detective Joel Jovanic...until he uncovers a connection between the disturbing series of vicious crimes and Annabelle Giordano, who is in the temporary custody of his soulmate, Claudia Rose.Annabelle is a troubled and traumatized teen who suffered the tragic loss of her mother and later witnessed the brutal murder of a beloved mentor. Neglected by a father who scarcely acknowledges her existence, it's little wonder the girl makes some disastrous life choices. But she has one staunch ally in Claudia, a highly regarded forensic graphologist who digs into the darkest of human secrets through the study of handwriting. When Annabelle involves herself with a questionable tattoo artist she re-opens a door to the grim side of life and goes down a path that could get her killed. A distraught Claudia will do anything to save her, even if it means jeopardizing her relationship with Jovanic. 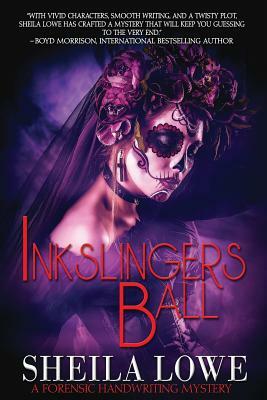 "A fantastic tale that takes readers on a frightening journey through the seedy side of a tattoo empire. Like Claudia Rose, Sheila Lowe is a court-qualified handwriting expert who testifies in forensic cases. She has more than thirty years experience in the field of handwriting analysis and holds a Bachelor of Science degree in Psychology. The author of "Handwriting of the Famous & Infamous," and "The Complete Idiot's Guide to Handwriting Analysis," her analyses of celebrity handwritings have appeared in Time, Teen People, and Mademoiselle. Her articles on Personality Profiling and Handwriting Analysis for the Attorney have been published in several bar association magazines. Sheila's clientele includes a wide spectrum of corporate clients, mental health professionals, attorneys, private investigators and staffing agencies, among others. Her award-winning Handwriting Analyzer software is used around the world and her profiles help uncover important information in background checks and pre-employment screening. She enjoys analyzing handwriting for individuals, too, helping them understand themselves and others better. For more information on Sheila, please visit her personal website www.sheilalowe.com.